IMOD contains two kinds of distortion correction that can be applied in the Newstack and Blendmont programs. One is a correction for a fixed distortion in the imaging process at a particular magnification. The other is a correction for the magnification gradient involved when imaging a tilted specimen. In each case, calibrating the distortion requires taking images on the microscope (preferably with SerialEM) and analyzing them in IMOD. For imaging distortion, this document gives some background information and describes how to acquire the images and analyze them. Instructions for calibrating magnification gradients have not yet been incorporated into this document and are available upon request. To measure a distortion field at a particular magnification, you need to take pairs of overlapping images, where only the stage is moved between the two images of a pair. When these images are lined up where they overlap, the distortion field causes image movements when toggling between two images. The image displacement at a given point is the difference between the distortion vectors at two different points in the field. This means that if we measure enough image displacements we can solve for the underlying distortion field. To obtain a robust solution, we want to have a situation where there are about twice as many measured displacements as unknown vectors, and where the different measurements are somewhat independent rather than redundant. This can be accomplished by taking four sets of pairs, where each pair overlaps over at least 50% of their area and the two images of a pair are arranged horizontally, vertically, or along 45° or 135° diagonals. These images are then analyzed with Finddistort. SerialEM has a procedure that will obtain such pairs (the Calibrate - Distortion menu item). It will work out the stage backlash, take an image, move the stage in the desired direction, take a second image, and assess the overlap. If the overlap is not within a specified range, it will try again, adjusting its local stage scaling to try to get a better result. On an FEI microscope, this procedure is remarkably successful up to a magnification of about 50K with an Ultrascan 4000 camera (1 micron field of view). For smaller fields of view, it is prone to fail due to imperfect and non-ideal stage behavior, and it may require trying several times at different stage positions. The specimen for taking these paired images must be rich in image information, because displacement will be measured in small patches, by default only 24 pixels square. If there are significant empty areas in the image, patches in these locations will not have enough information to give good correlations. 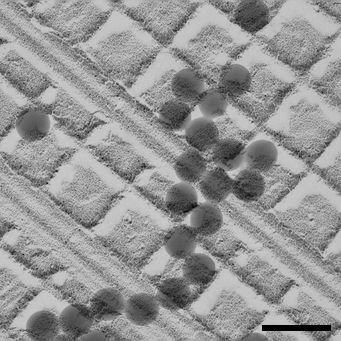 An ideal specimen has been prepared by Misha Sherman at University of Texas Medical Branch, by sputter-coating gold onto standard carbon-coated grids. The images below, from left to right, were taken with a US4000 on an F20 at 5K, 19K and 80K; scale bars are 500, 100, and 20 nm. 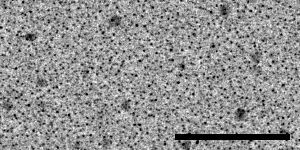 At the lowest magnification there are some larger particles as well as dense fine detail from the many small particles; at intermediate magnification there is still a good distribution of small dense particles in the gaps between larger ones. 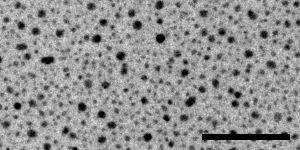 At high magnification, the gaps between particles are large enough to be a concern, but there is sufficient structured detail from the carbon to allow the correlations to succeed in the gaps. The largest particles may disappear with beam exposure, but are not needed for the image correlations to work at lower magnifications. Sections of stained material can also be used provided that that there is sufficient density everywhere in a field. 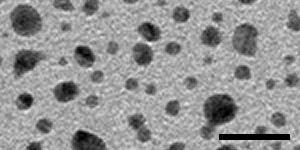 High-pressure-frozen, freeze-substituted material is best because it tends to retain more detailed structure in the cytoplasm. More extracted material may work at low to intermediate magnifications and fail at higher magnifications as empty areas become too large. Large mammalian cells (for example, T-cell lymphocytes) and tissue sections should be suitable. Sections of yeast cells are not optimal because they contain vacuoles and their area is often not large enough. The cross-line grating with gold crystals is not an adequate specimen except at relatively low magnifications, because the areas without gold do not have much information in them. The specimen does not need to be very resistant to shrinkage in the beam if you can acquire the pairs automatically with SerialEM. The specimen does not need to have significant thickness (unlike the specimen needed for measuring the stretch in the distortion field, described below). A sputter-coated grid or a suitable plastic section may be available upon request. The images themselves must be rich in high spatial-frequency information and have relatively little noise. In addition, the images generally do not need to be any larger than 1024 pixels. One approach with CCD camera images is to bin the images to no larger than 1024 pixels, in order to operate the camera in its most efficient zone, and set the beam and exposure time to give clean images with a high number of counts (e.g., > 1/2 of saturation). However, it may be easier to get a good signal-to-noise ratio by acquiring 2K images with higher exposure time. With direct detectors, it is more appropriate to acquire 2K images or even unbinned images to avoid saturation of the 16-bit image. The default spacing parameters for analysis in Finddistort are tuned to 1K images. If you do take images larger than 1K, you should either reduce them to 1K or scale the various parameters up by the appropriate factor (details are given below). There is some evidence that the latter approach may give better fits, as long as the data have little noise. However, there is no filtering of the image data in Finddistort, so if the images are somewhat noisy, they should be reduced to 1K. Reduction can be done in Newstack with binning or with anti-aliased reduction using the "-shrink" option. If you take 4K images, you should at least reduce them by 2. Reduction by 4 should definitely done with the "-shrink" option to remove aliased noise (i.e, "-shr 4"). The information provided by the pairs of overlapping images can be used to solve for a distortion field that does not contain any overall stretch. A stretch along one axis of 1-2% is typical for projection in an EM, and an energy filter and camera imperfections may impose even bigger stretches. Using a distortion field without this stretch included will not impair the blending of overlap zones in montages, or the alignment of tilt series (at least if the "Projection stretch" variable is included in the alignment). However, it will result in slightly anisotropic reconstructions. To determine the stretch in the distortion field, you need an image of the same structure rotated by 90°. The difficulty here is that if the structure is tilted differently in the two views, then it may be foreshortened by the tilt and some of the stretch in the alignment transform will reflect this foreshortening rather than the stretch in the distortion in field. Although this effect is a small one because the cosine is very close to 1 near 0°, it is possible to control for it. The solution is to take a small tilt series of a specimen that has some distribution of features in depth, before and after rotating by 90°. The pairs of views from the two series that match the best will be the closest to being tilted the same in the two orientations, and will give the best estimate of the stretching due to rotating in the distortion field. Matchrotpairs is used to find the best matching pair of images. The tilt series should be at 1.5° intervals between -4.5° and 4.5°. The tilt series does not need to be very well aligned; the simple macro given below is adequate for acquiring it. The rotation does not need to be exactly 90° (80° is good enough). Images 1K in size are adequate. The most important thing is to get a pair of images before and after the 90° rotation. Being able to refine the estimate by controlling for tilt is secondary; in the extreme case, a tilt of 4° will make the estimate of stretch be off by 0.0024. For plastic sections, it should be easy to locate the same area and there should be adequate 3D information. To minimize shrinkage, it is important to irradiate the chosen area for a long time (at least 5 minutes), and to avoid exposing it to a much additional dose while rotating and repositioning. Some degree of uniform shrinkage can be tolerated since the analysis will separate an overall mag change from the stretch in the alignment transformation. For the cross-line grating, an area with many latex spheres should be chosen to give enough information about features at different depths. A clump of spheres will serve this purpose as well as provide a feature that is easy to locate after rotation. Try to find a clump with as many spheres as in the example below. If you do not have a rotating holder, pick one of the grid squares around the center of the grid if possible, so that the area can be found again without too much trouble. The latex beads should probably be irradiated somewhat but no special precautions are needed thereafter. With gold on a film, the main issue is getting a thick enough film. Doing the analysis with a standard carbon film is troublesome and tedious because the separation between surfaces is so small. Based on experience with a 30-nm film, it seems that a film of at least 60 nm thickness would be needed to make the analysis work as easily as for other samples. A finder gird should be used to make it possible to locate the area after rotation. Use a medium to small objective aperture to get good contrast. Find a good area full of image detail that is somewhat larger than the field of the camera. If this area is big enough, you will not need to worry about recentering it after each pair. For a plastic section, irradiate the area for a few minutes to get almost all of the shrinkage over with. The shrinkage between successive images will then be insignificant. At a given magnification, set the beam and exposure to give the desired number of counts. Focus the specimen. A small amount of underfocus is acceptable, and might be preferred at high magnifications to bring out detail in the carbon film. Run the Calibrate - Distortion routine, specifying direction 0. It will save the two pairs when it succeeds in getting pairs that overlap by the right amount. If it fails, first try it again. If it still fails and the stage moves are under a micron, try moving to a new area at least a few microns away. If this still fails, select the "Set overlaps" menu entry and make the acceptable range of overlaps larger. Run the Calibrate - Distortion routine for directions 1, 2, and 3. Repeat these steps for each magnification where a calibration is desired. Set up two macros, one to tilt to the starting angle and present a trial picture, and one to acquire the series. Turn off "Align on Save" in the Buffer Control Panel. Pick an area on the specimen that you will be able to find after rotating. If using a plastic section, stabilize the section under the beam for a while. Also, take a relatively low mag picture of the area if necessary to use as a reference when searching for the area after rotating. Adjust centering with stage moves if necessary. If using a plastic section, go to a low mag and spread the beam to avoid intense exposure. Rotate the specimen by about 90° and relocate the area. Again, if using a plastic specimen, try to locate the area at low mag. If you took a reference picture, switch to the mag of that picture and try to use the camera rather than the screen. Center the desired area approximately. Adjust centering with stage moves if necessary. (Reset image shift after shifting the image into alignment with the right mouse button). The centering does not need to be perfect; the alignments will work if the areas overlap by 80%. Now you have data to analyze. The analysis proceeds in three stages. First you use Finddistort to get a stretch-free distortion field. Then you use Matchrotpairs to analyze the rotated images and get a transformation that provides information about the stretch. Finally, you rerun Finddistort with this transformation to get the true distortion field. If you do not have 1K images, you need to increase four parameters proportionally from their defaults. 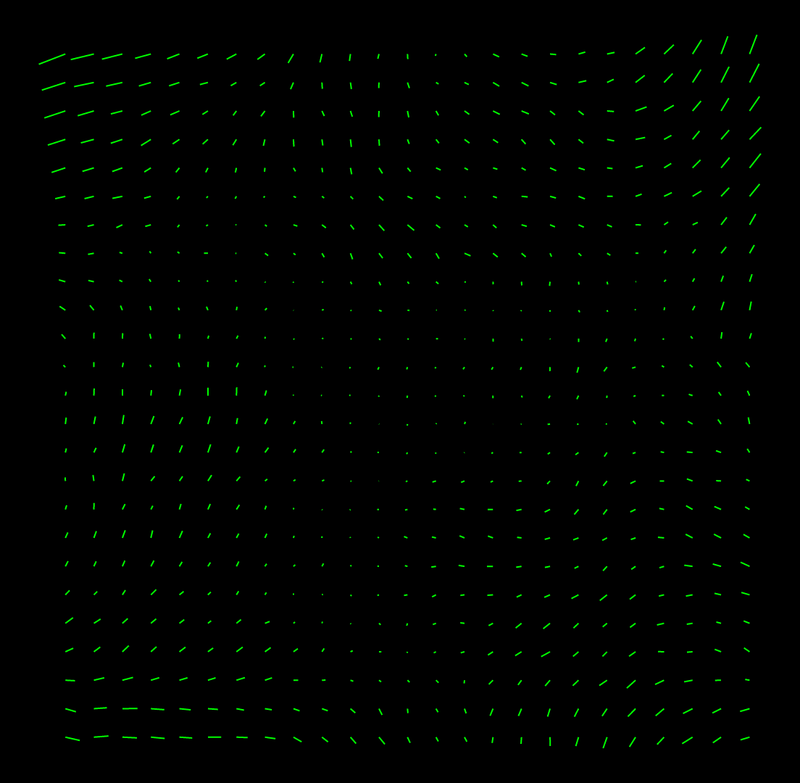 The parameters are the spacing between correlated boxes ("-grid", default 16), the spacing between values used to solve the linear equations ("-data", default 20), the spacing between values in the distortion field file ("-field", default 40), and the size of the correlated boxes, which is normally the only parameter that is varied ("-box", default 24). Thus, for 2K images, you should add "-gri 32 -dat 40 -fie 80" to all of the Finddistort commands given below, plus either "-box 48" or double the recommended increase in box size. The binning must be specified with the "-bin" parameter. It should be the final binning, the product of the binning on the camera and any reduction applied to the images. The "-pat" parameter makes the program output a .patch file that can be converted to an IMOD model with Patch2imod. The input file is the file of distortion pairs for one mag, and the last entry is a root name for a variety of output files. The first line shows how much the shifts used to align the overlapping images changed between iterations, and the second line shows the mean change. The third line indicates the size of the data matrix on this iteration. The fourth line gives condition numbers indicating how suitable the data are for linear solution. The mean and maximum residual of the fit indicate the reliability of the solution. The final line shows the mean and maximum change in the distortion field from the previous iteration to this one. Both these changes and the changes in shifts will go to zero unless something is wrong. If the maximum residual is higher than 1 (or ~1.7 for 2K images), you should increase the box size from its default of 24. Try 32, and if the error is still high, try 40 (64 and 80 for 2K images). With these larger box sizes, reduce the indent to 2; i.e., add the arguments "-box 32 -ind 2". All of the pairs (1-2, 3-4, 5-6, 7-8) should look as well aligned as possible, but when you toggle between them you will see the effects of the distortion field. The pairs should match very well. Here you provide the no-stretch distortion field, specify the binning of the images again, and give the names of the tilt series files and an output file for a transform. If the fit is poor, or if you have anomalously high differences at the proper rotation angle, rerun Matchrotpairs with "-m" to run Midas and set the initial alignment. Also, prior to IMOD 4.8.27, it might be necessary to run Midas to set the rotation angle if it is not within ~5 degrees of 90. This time you can add "-a" and the rotation angle determined from the first run (+90 or -90). Midas will open up with the central image from each tilt series. Use shift and rotation to align the images. Save the transforms and exit Midas. All pairs will then be analyzed with this alignment as an initial alignment. If Midas opens twice due to a bug in the new version of Matchrotpairs (IMOD 4.8.27 - 4.8.37), you can prevent this with the option "-mirror -1". will produce a set of 5 transform files, rp18K-1.xf, rp18K-2.xf, etc, that contain the transforms for aligning each of the sections in the first series to section 1, section 2, etc in the second series. When this starts, you can assess the match between each section of ts1 with section 1 of ts2. To compare with the next section, use the menu entry File - Load transforms and select rp18K-2.xf. Then make the reference section be 2 and you should see aligned image pairs again. In general, make the number of the reference section match the number of the transform file. In this way, you can compare all pairs if necessary and find the best match. Finally, rerun Matchrotpairs without the -x option and specifying the best pair of sections. For example, if the best reference section is 2 and the best current section is 4, enter "-za 4,4 -zb 2,2". The "-usexf" tells it to use the existing raw transforms on the first round, and "-str rp18K.xf" tells it to derive the stretch from the transformation file. Be sure to add "-box", "-ind", and other parameters that you used on the last initial run. These lines describe the transformation between the rotated images in terms of a rotation, magnification, and stretch. If the mean mag is not 1.0, then the transform is scaled up to have a mean mag of 1.0 by increasing its mag component. The result is a no-mag transformation that can then be assumed to be the result of the same underlying stretch in the two images. These lines describe the underlying stretch transformation that must be added to the distortion field. The stretch implies a transformation between rotated images, which should match the no-mag transform given above. After adding the stretch into the distortion field, the field is analyzed to determine the net stretch transformation that has been embedded in the field, which should closely match the solved stretch transformation above. The final distortion field is in the file with extension ".idf". Rename such files if desired to provide whatever information users need to identify it (e.g., the date or the camera). In order for Etomo to find the files, place them in a subdirectory named "Distortion" of the directory pointed to by the IMOD_CALIB_DIR environment variable. By default this directory is /usr/local/ImodCalib except on Windows systems without Cygwin, where it is C:\ProgramData\IMOD.